Humans Season 2 Trailer - Watch at ComingSoon.net! AMC announced today that Humans season 2 will make its highly-anticipated return on Monday, February, 13th at 10:00 P.M. ET/PT. Check out the Humans season 2 trailer in the player below. 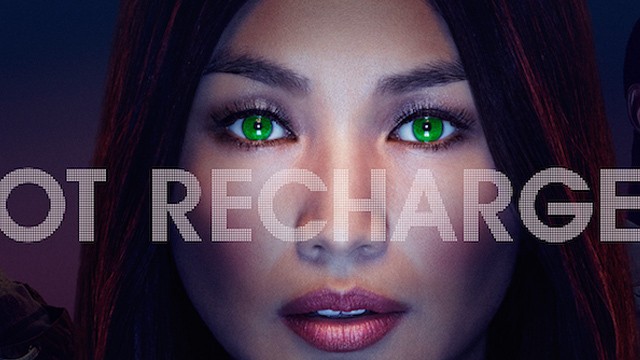 You can also take a look at new Humans season 2 key art in the gallery viewer at the bottom of this page. Humans is penned by writing partners Sam Vincent and Jonathan Brackley (Spooks, Spooks: The Greater Good) and is set in a parallel present and explores what happens when the lines between humans and machines are blurred. The eight-episode Humans season 2 picks up several months after the events of season one, with Niska (Emily Berrington) still at large and in possession of the consciousness code. Her synth family, Mia (Gemma Chan), Leo (Colin Morgan), and Max (Ivanno Jeremiah), unaware of her location, are each trying to find their place in the world while Joe (Tom Goodman-Hill) and Laura (Katherine Parkinson) attempt to mend their marriage. As unconfirmed reports of synths behaving inexplicably surface, the ripple effects of one simple yet seismic decision sees the past return dramatically and surprisingly to the door of the Hawkins house. Joe, Laura, and the entire family are faced with a difficult choice that will put the family under an intense spotlight. As an emerging form of intelligent life – the synths – and an established one – humanity – fight for their places in the world, a thrilling multi-stranded narrative evolves which continues to ask: who has the right to determine what it means to be alive? Carrie-Anne Moss (The Matrix, Jessica Jones) joins the cast as Dr. Athena Morrow, a pre-eminent Artificial Intelligence expert who is driven by her own motives to create a new kind of machine consciousness. Additional casting includes, Sam Palladio (Nashville, Episodes) as Ed, a struggling café owner trying to breathe life into his family business; Marshall Allman (True Blood, Prison Break) plays Milo Khoury, a young Silicon Valley billionaire, founder and CEO of a leading technology company intent on changing the world; Sonya Cassidy (The Paradise, Olympus) as Hester, one of the most unique Synths on the planet; Bella Dayne (Man in the High Castle) as Astrid, a free-spirited young Berliner who will be tested by someone special who comes into her life; and Letitia Wright (Black Panther, Cucumber, Banana) as Renie, a bullied seventeen-year-old “synthie,” a fast-growing subculture of humans pretending to be Synths. In addition to Parkinson, Goodman-Hill, Chan, Berrington, Morgan, and Jeremiah, returning cast for Humans season 2 also includes: Lucy Carless as Mattie Hwkins, Theo Stevenson as Toby Hawkins, Pixie Davies as Sophie Hawkins, Neil Maskell as D.S. Peter Drummond and Ruth Bradley as D.I. Karen Voss. In addition to Vincent and Brackley, Humans season 2 is written by Joe Barton, Charlie Covell and Iain Weatherby. The series is produced by Kudos in association with Matador Films. Executive producers are Derek Wax (The Hour, Capital) and Chris Fry (The Smoke, Spooks) for Kudos; Vincent and Brackley; and Henrik Widman and Lars Lundström for Matador Films. The series is produced by Paul Gilbert and directed by Lewis Arnold (Broadchurch), Carl Tibbetts (Black Mirror: White Bear), Francesca Gregorini (The Truth About Emanuel) and Mark Brozel (Dickensian). Humans was commissioned for Channel 4 by Beth Willis and Simon Maxwell, and Joel Stillerman and Kristin Jones for AMC. AMC will air a Humans first season marathon will air on December 30th from 9:00am – 5:00pm ET/PT. What do you think of the Humans season 2 trailer? Will you be tuning in when the series returns? Let us know in the comments below!